Sunday afternoon I had another All Occasions Cards class. We made five cards, and a variety of greetings to add later, as needed. It's a great way to have a supply of cards on hand that can be quickly customized for just about any occasion! This was one of the cards. It uses the new Flower Patch stamp set and the matching Flower Fair Framelits Dies. Easy-peasy to stamp and die-cut the flowers, and then pop them up on Stampin' Dimensionals! 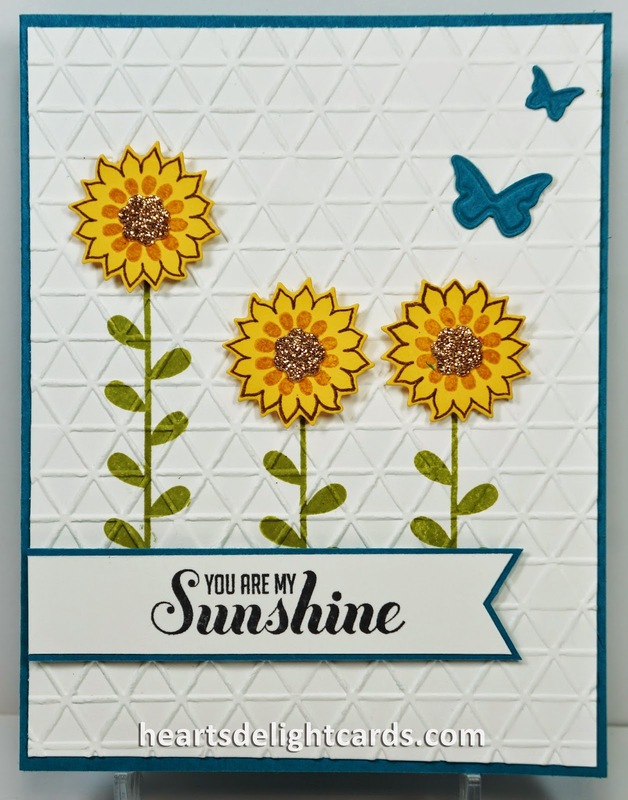 The stems from Flower Patch were stamped first in Old Olive, then the panel was embossed with the new Tiny Triangles embossing folder and adhered to the card base. The flowers were then stamped on Daffodil Delight cardstock in Soft Suede and Hello Honey. Because these are photopolymer (totally clear) stamps, it was a snap to place the centers right where I wanted 'em. Then they were die-cut, as were the Champagne Glimmer Paper centers with the Flower Fair Framelits. That greeting is from Ray of Sunshine. I thought it was perfect for the sunflowers! Butterflies from the Beautiful Wings embosslit added a little balance to the rest of the card. The Flower Patch stamp set and Flower Fair Framelits are available as a bundle, too, so you can save 15% over purchasing them separately! Congrat - YOU - lations!